Speaking to an Online Psychologist gives you the opportunity to access professional services without having to leave your home or work. We operate from across Australia which allows us to easily cover all regions. 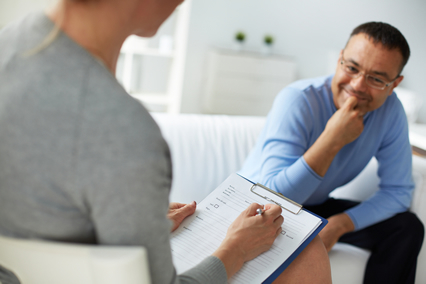 All of our therapists are Registered British Psychologists. You will need a reliable internet connection and a tablet, smartphone or computer. Online Chat is available through a secure chat service and you will be provided with the log in details. If you prefer a phone appointment we can organise to call you for the scheduled consultation, wherever you are in the world, at no extra cost to you. Phone, online chat and video sessions are normally 50-60 minutes in length but this is flexible and can be arranged to fit into your schedule. Appointments are available during business hours, early morning, evening and weekends. Research also indicates that people are likely to feel less inhibited when using online services. This is particularly useful if you are experiencing a high level of anxiety that makes it hard for you to discuss these concerns face to face. Speaking to an Online Psychologist is appropriate for many common psychological concerns, including depression, anxiety, panic, phobias, trauma, sleep difficulties, weight concerns, worry or stress, managing pain, intimacy or sexual problems, anger and adjusting to life changes. Please contact us for an appointment or book online.